The wide angled siping forms a continuous "S" shape to maiximize the stability of each tread element. This gives the tire many sipe edges for wet and winter traction, without sacrificing the tire's handling characteristics. 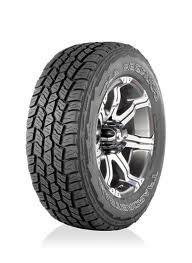 The variable full depth siping within the tread elements help maintain the wet traction capabilites of the tire as well as provide an attractive worn appearance throughout the life of the tire. The tread compound of the Courser AXT is infused with silica. The silica, in conjunction with the tread design features improve the all-weather traction and overall treadwear.